Tuesday, August 18 –2:00 PM, Glynn County Commission workshop to discuss, among other things, a roundabout at the junction of RT 99 and Highway 17 and changes to land use ordinances. Friday, August 21, “Puddy” Smith, one of the original incorporators of S.L.E.A.T. returns to the island for a week in preparation for a permanent relocation at the end of September. 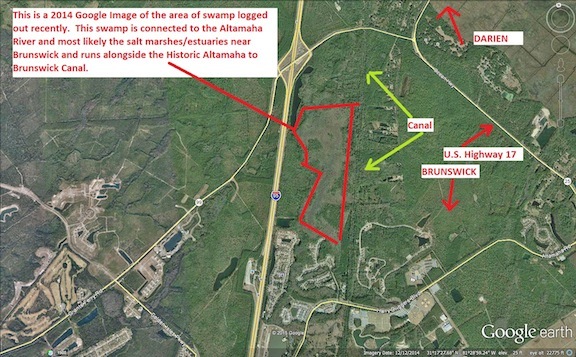 James Holland reports unauthorized clear-cutting on the 686+ acre tract just east of I 95 along native road. Since the parcel is already zoned PDG (planned development general) it isn’t entitled to conduct timbering operations and should, ideally, provide a tree survey before land disturbing operations are undertaken.County records identify this as parcel # 03-12108, owned by Brunswick Exit 42 LLC, registered in Georgia, whose agent is Joseph Strength. Hopefully, it will be a prelude to getting the Brunswick Waterfront cleaned up by insuring that all the lease holders are in compliance with building permits, storm water permits and waste water permits so more conflagrations and the pollution of our rivers can be avoided. Finally, S.L.E.A.T. has a Google+ page. Feel free to sign on.